Multivox FR6M "Rhythm Ace" 1/3-page advertisement from page 42 in Contemporary Keyboard December 1977. While researching Retro Synth Ad's first Multivox post - the Firstman SQ-01 Sequence Synthesizer - one little nugget of Multivox criticism kept on popping up. The notion that some of the company's designs and circuitry were very similar to those from other companies - in particular Roland. "Multivox were an American based synthesizer company from the mid-1970s. They specialized in delivering Japanese-designed and built equipment to the American market. They were criticized as having design and circuitry extremely similar to but inferior to designs by Roland." "... similar but inferior..." - Ouch. If you followed a certain link in my last blog post to Gordon Reid's July 2002 Sound on Sound article, "A tale of two string synthesizers", you would have run into one of the more well-known online examples of this comparison - Roland's RS202 and Multivox's MX202. The article is fantastic. A definite read. "I contacted Mr Hiro Ueno, the Director of the Development Division at Roland Corporation in Japan, and he informed me that there was neither a licence agreement nor a joint development agreement between Hillwood and Roland. So my initial hunch was correct all along: Hillwood was a parasite, blatantly copying Roland's designs, right down to the component level." I bring up this article for another reason - in a call-out box, Gordon also points out the similarities between this blog post's feature player, Multivox's FR6M "Rhythm Ace", and Roland's CR68 and CR78. "Keyboards were not the only Multivox products that 'shared' design features with Roland products. Take the FR6M Rhythm Ace as an example. This was a simple, analogue beatbox with 27 preset rhythms, much like any number of others from the same era. But its knobs and switches were identical to those used by Roland at the time, and the design and case were very similar to those of the CR68 and CR78." The thing I found most surprising about this FR6M advertisement after reading all this, was Multivox's attempt to protect their "Rhythm Ace" trademark by adding a nice little registered trademark symbol beside the name in the title - concerned that another company might come along and steal the name of their product. My reasoning being that it was Roland founder Kakehashi who created the original "Rhythm Ace" name years earlier when he had started his first musical instrument company Ace Electronics (later changed to Ace Tone). I asked myself the obvious question - just how big are Multivox's balls? Snarfing the"Rhythm Ace" name from Ace Tone's - a company that the founder of Roland used to own? On the surface it looks like exactly that. - Kakehashi has already been building musical instruments such as Theremins and guitar amplifiers for a few years, starts Ace Electronics Industries. - Ace Electronics creates first Ace Electronics R1 Rhythm Ace. Flops! - Ace Electronics creates the FR1 Rhythm Ace. Successful! More Rhythm Ace products to come! Initially, this really makes it look like Multivox yoinked the "Rhythm Ace" name from Ace Tone. And I would have gone to bed even more angry at Multivox than I had the night before. But then I found a little footnote on the Ace Electronics Wikipedia page that made me laugh even harder! "In 1970s, some models were also supplied to Multivox, an OEM brand of Ace Tone's general agency in the United States". And can you guess what one of those models of "Rhythm Ace" was? Yup - the Multivox FR6M Rhythm Ace. Maybe you are all thinking... "duh! yah!" And maybe everyone but me already knew this. But this was new to me. 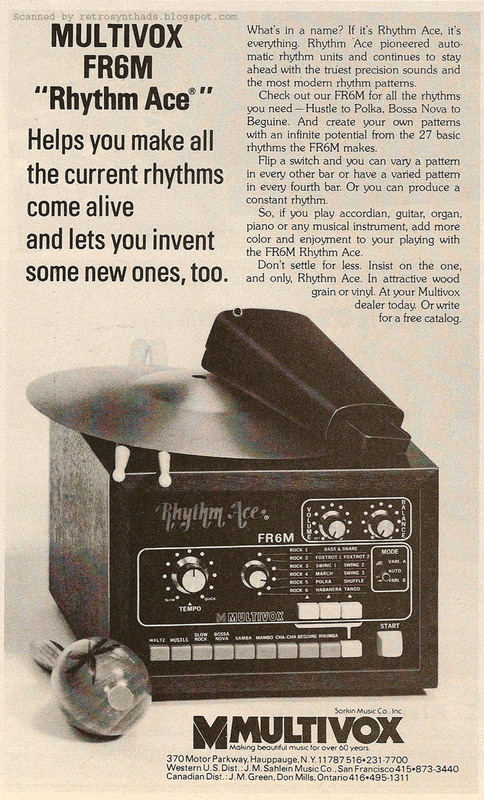 :) In the end, Multivox DID have legitimate rights to use the "Rhythm Ace" name for this product. Doh! And, consider that if the CR68/78 and the FR6M came from a related ancestor - the Ace Electronics FR1 Rhythm Ace - it could explain some of the similarity in sound, no? But I'm just guessing there, and definitely not trying to make excuses for Multivox. Either way, the "Rhythm Ace" name is one thing Multivox didn't "borrowed" right from under Ace Tone/Roland's nose. And Roland is still King of the hill in my books. Something happened after I wrote my last blog post. I kept on researching. The reason I kept on researching was mostly because of the July 1981 Spec Sheet promo that I initially dismissed as not providing any info that didn't already appear in the ad. But as I re-read that Spec Sheet, something clicked. Both because of something I saw, and something I didn't see. "Multivox Sequencer. The SQ-01 Mini Music Lab is a monophonic synthesizer and sequencer. It operates on either AC current or batteries. It will record up to 1024 notes on 16 channels, combine time values, program glides, program triple and duple meters, and play back with from 30-300 quarter-note beats per minutes with sixteenth-note subdivisions. The synthesizer portion of the unit has a seven-octave range, a 24db/octave filter, and an envelope selection system. Rear panel jacks offer interface possibilities, syncing to other sequencers or clocks, or other synthesizer control. An optional bass pedal controller, the BS-01, is also available. Multivox/Sorkin Music, 370 Motor Parkway, Hauppauge, NY 11787." Right at the beginning... The SQ-01 Mini Music Lab! What an awesome spin on this tiny machine. But yet I find this descriptive label nowhere in the ad. Boo! You've got every other marketing trick in the book coming through in that ad, but something as cool sounding as Mini Music Lab is totally left out. And when you gaze at that machine with its lovely membrane touch controls and other futuristic good looks, my mind immediately gravitates toward the term "Mini Music Lab". And what was missing from that Spec Sheet blurb? "Fastman". Only Multivox and Sorkin Music get creds. These two things just led to more questions. Where did the whole "Mini Music Lab" label come from if not from the ad? And who the heck was Firstman? I decided to do a bit of digging to see what other info I could uncover. Lucky for me, the obvious comparison to Roland's legendary TB-303 makes the Firstman SQ-01 a rather easy machine to find information on. Gun. Fish. Barrel. It wasn't long before Google provided these answers, and more. One quick Google search and I found the origin of the "Mini Music Lab" label. Turns out it comes directly from the manual - I found an online PDF at chipforbrains.info. And the "Mini Music Lab" name isn't just referenced once in the introduction. It is referenced throughout. Interesting that this term wouldn't make it into the ad for the instrument. That was definitely a conscience decision on someone's part. And in my opinion, a missed opportunity. As far as who Firstman was, and its connection to Multivox? 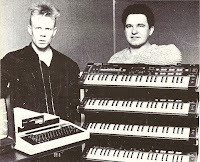 Those questions, too, were quickly resolved when I came upon the Firstman/Multivox connection in a July 2002 Sound On Sound article titled "A tale of two string synths" written by Gordon Reid. The article focuses on the similarities of the Roland RS202 and Multivox MX202, and while looking at the circuit boards inside the Mulitvox, Gordon found the name Hillwood. "I found the name Hillwood, a little-known Japanese manufacturer who were active in the late 1970s and early 1980s. This was a company founded by a Japanese gentleman called Kazuo Morioka, whose name translates as First Man Wood Hill. Morioka thus gave his name to the Hillwood synths and keyboards released throughout the mid-to-late '70s, as well as the short-lived manufacturer Firstman." Gordon Reid also points out that that even though Multivox, Hillwood and Firstman were some of the first casualties of the digital synth revolution of the 80s, Morioko continued working in the industry. "...it appears that Kazuo Morioko did not depart the world of synthesizers; he went to work for both Hohner and Akai, where, in 1983 or thereabouts, he helped to design parts of its aborted Akai Studio System, including the MG1212 multitrack recorder and the AX80 polysynth..."
You can also find a wack of photos online including this December 2011 auction post on MATRIXSYNTH. That machine sure does look purrrdy in colour. Also found a good May 2011 MATRIXSYNTH auction post for the optional BS-01 foot pedals that also appear in the ad. Excellent! There are also a few good video demos of the unit online, and I really enjoyed this one. BTW - can I get dibs on the band name "Mini Music Lab"? 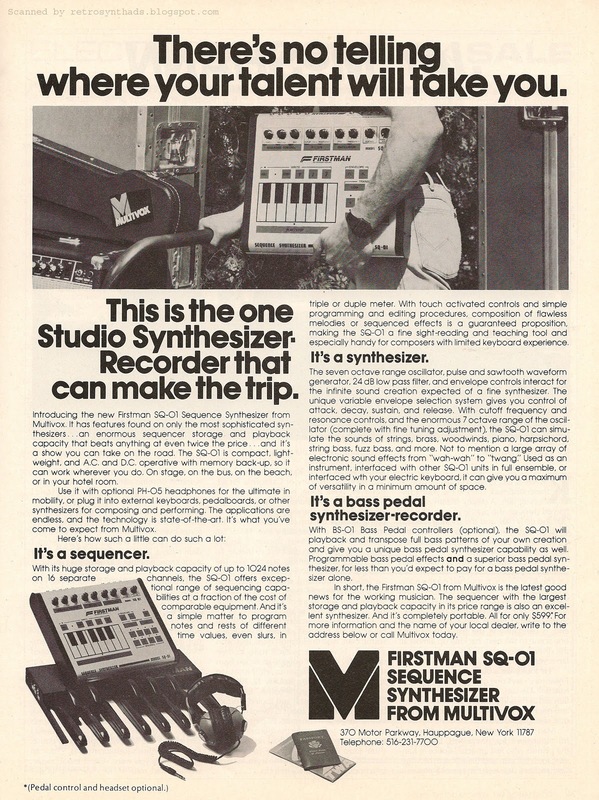 Firstman SQ-01 Sequence Synthesizer from Multivox 1-page advertisement from page 23 in Contemporary Keyboard June 1981. Until recently, I've never really had an interest in a lot of Multivox stuff. Reading through older Contemporary Keyboard magazines, the Multivox brand always left the impression they were an "organ" and "preset keyboard" company. Even as my knowledge of the company and its products grew, my mind never really made the move to include "synthesizer" and "sequencer" in whatever part of my brain held Multivox reference info. I would literally pass by their ads completely, not giving them a second look. I'm a creature of habit, and it's dang hard to break any of my bad habits. Whether that is chewing the inside of my lip or changing my view on a company, product or service. I do it *a lot*, and I'm not the only one. Casio is a great example where, for once, I'm on the other end of the equation. As good as I thought Casio's CZ- and other professional synthesizers and samplers were, I just couldn't convince others of this fact. And that includes many of the other synth enthusiasts in my small part of the world. For some reason, Casio always seems to tickle the neurons that dig up memories of toy keyboards, nerdy digital watches and calculators. It's hard to convince them of Casio's awesomeness. And, I gotta add that coming out with the diminutive CZ-101 didn't really help matters. It's looks screamed 'toy'. Even when I showed my synth-pop friends a photo of Vince Clarke standing next to a stack of them. Gah. 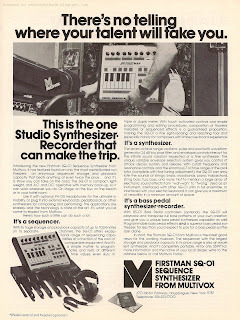 But, bringing this post back to the Firstman SQ-01, I gotta say this ad was the first step in my brain's conversion of Multivox from organ company to synthesizer company. But it is still an on-going, bumpy, up-hill ride. The ad began appearing in CK around June 1981 and continued to run pretty regularly until around November 1981. It's a great looking ad with large photos, plus good layout and design to boot. The only real problem is the ad-copy - there is just so much of it. Normally I like this is the ad, but in this case Multivox is really trying too hard to make this instrument all things to all people. And in some cases, really over-hyping some of its functionality - especially for a piece of kit that sold for only $599.00 in 1981. All things: Its a sequencer! But it has a VCO and Envelopes. Its a synth! But I see bass pedals in the ad. It's bass-pedals! But it says it has a 7-octave range. All people: It is a sophisticated synth. Cool. It's great for people with limited keyboard experience as a sight-reading and teaching tool. Wait... what? And to compound this problem, Multivox takes the normal amount of marketing hype I expect to find in ads to the next level. "The SQ-10 can simulate the sounds of strings, brass, woodwinds, piano, harpsichord, string bass, fuzz bass, and more." "[The synthesizer] can give you a maximum of versatility in a minimum amount of space". This little beast is really good at what it actually does - a fun and easy to use sequencer - so why not focus on that? Even marketing hype can go too far.And when marketing hype hits a brick wall of reality, audience perception is left in the ditch. Before the Internet, a lot of that North American perception was no doubt formed through reading magazines such as Contemporary Keyboard. From ads... but also what is written by those writers and editors. And, in the case of CK, that would be mostly seen by readers in Spec Sheets and Keyboard Reports. The SQ-01 Spec Sheet promo appeared in the July 1981 issue of Keyboard Magazine, just a month after this ad first touched down. Unfortunately, that little review didn't provide any editorial perception - it was all technical. But, as luck would have it, a Keyboard Report on the SQ-01 did turn up in the October 1981 issue of CK, written by the very perceptive Dominic Milano. "The digital sequencer we'll be looking at this month, the Multivox SQ-01, is much simpler than these space-age machines. It also has a feature that non of them have: In addition to being a monophonic digital sequencer, it has its own simplified synthesizer voice built into it, so if you don't want to interface it with an already existing synthesizer, you don't have to to. You can listen to it all by itself. And it doesn't cost an arm and a leg to buy one, making it attractive to those of you who might be curious about owning a sequencer buy have been put off in the past by all the technical aspects of having to interface a sequencer to a synthesizer. It can be a good learning tool to experiment with before getting involved more technically with sequencer/synthesizer setups." "Overall the synthesizer voice sounds fairly thin, probably due to the fact that there is only one oscillator and no modulation." And his conclusion hardly mentions the synthesizer functionality at all - focusing mostly on the sequencer. "The SQ-01 isn't the be-all and end-all of sequencers... Overall, though, the SQ-01 does all right as an instrument for the neophite who want to get involved with digital sequencing on a limited budget..."
So, even though Multivox's ad tried to push the SQ-01 as a "studio synthesizer" that could simulate a wack of keyboard, string, brass and bass sounds, in actuality, the CK report found the synthesizer voice to be relatively simple and thin. In the minds of readers, the whole thing probably plays out something like this: A reader sees the ad. Processes. Then sees the report. Processes the disconnect. And not the normal marketing-hype type of disconnect. A true, grand-canyon-style disconnect. And over time, if a company keeps that up, it will erode the brand..
Maybe I'm just grumpy today. And sure, other companies did it as well. But, like I said at the beginning of this post, I really wasn't interested in Multivox before this ad. And even though the disconnect between the ad and the CK report is so great, for some reason, it *still* helped me move Multivox from the organ pile to the synthesizer pile. Just the crappy synthesizer pile. Whether deserved or not. So, maybe they won. See, even a creature of habit like me can change. A little. 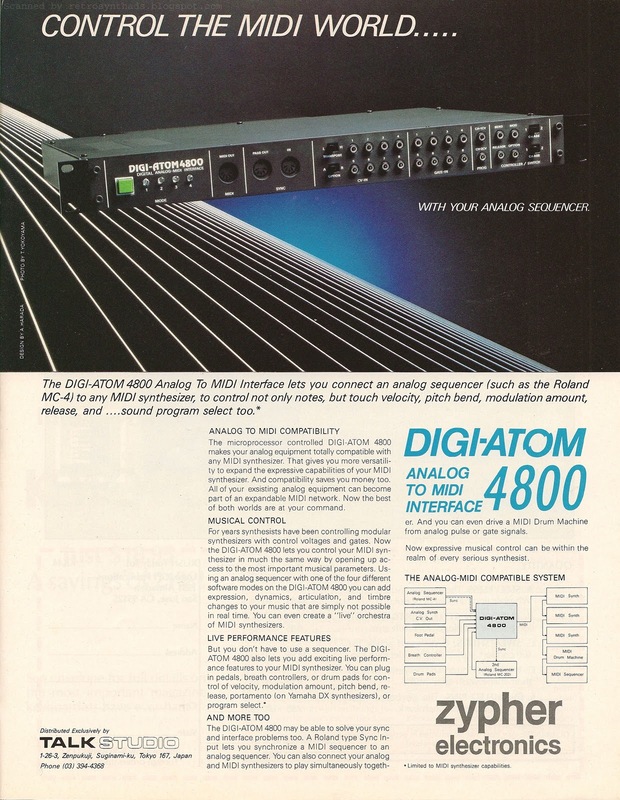 Talk Studio/Zypher Digi-Atom 4800 analog-to-MIDI interface 1/3-page advertisement from page 27 in Keyboard Magazine August 1984. Been a great winter so far. Uncommonly warm. Almost creepy. But over the last few days, we finally got our first real cold snap of the season with temperatures finally hitting negative double digits (celcius! ), so I'm starting to feel a little cooped up and thinking about beaches in warmer climates. But it does help motivate my blogging. 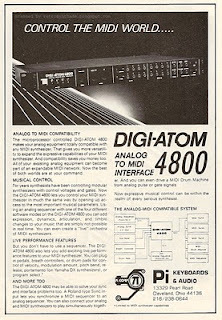 In part 1 of this Digi-Atom 4800 blog post, I provided a brief comparison between this second ad and the first one, while at the same time giving a good demonstration of my Web surfing habits when I fixated on the Digi-Atom's new distributors, Pi Keyboards & Audio. .
"Just when you thought you were safe from the terrors of the patch cord jungle, free to escape to the bliss of single-cord interfacing with MIDI (the Musical Instrument Digital Interface), along comes a new class of MIDI products that makes your keyboard setup look like it has more in common with a bowl of spaghetti than anything even remotely resembling hi-tech keyboards. But don't despair. There's plenty of musical good to be found even with the synthesizer-meet-wet-noodles look." The rest of the article explains the different modes of operation and ends the bulk of the review with a connection example pulled from the manual. In the conclusion, he lists the price at $1,395.00 and the importers as Shelton Leigh Palmer & Co. Nice. It was a month later that Pi Keyboards & Audio included this ad in the August 1984 issue of Keyboard. 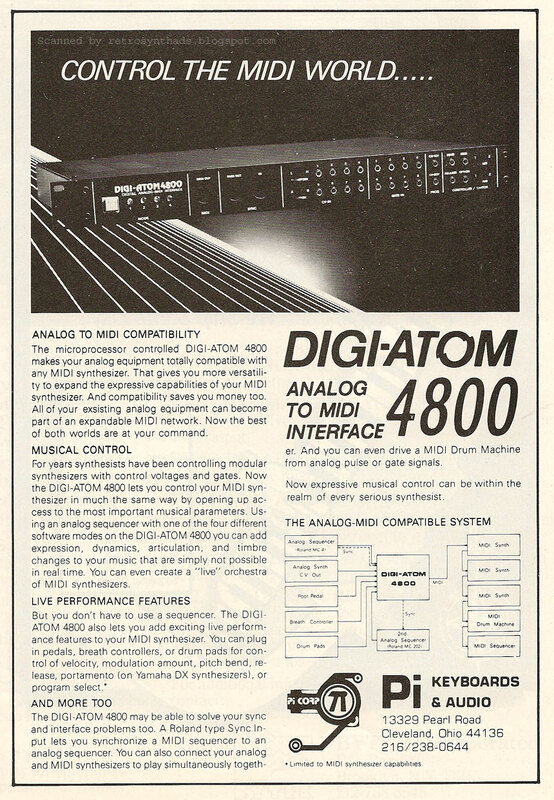 Then, in September, the Keyboard monthly giveaway was the Digi-Atom 4800 Interface. The contest copy only includes Talk Studio - not Zypher - in the 'thank you' list. Included is a bit of a summary of it's functions. After a brief hiatus, a Spec Sheet write-up in the December 1984 issue of Keyboard Magazine provided a little more light on the change in distributor. As well as the price drop of over $200! "Digi-Atom Distributors. U.S. distribution for the Talk Studios/Zypher Electronics Digi-Atom 4800 analog-to-MIDI interface is now being handled by Pi Keyboards & Audio. List price for the unit in the States has been set at $1,195.00. Pi Keyboards & Audio, 13329 Pearl Rd., Cleveland, OH 44146." I asked former CEO David Yost about Keyboard's apparent affection with the Digi-Atom, and he explained that it was, in fact, Keyboard that initiated most of the coverage. "Their editors and writers at the time were very very sharp. In fact I think it was shortly after the Keyboard coverage [started to appear] that I was looking into selling the Digi." Turns out that David's first passion was electronic music, and David figured that getting into sales and repairs was the most obvious way to get gear. He had a few large systems that needed good CV/gate converters for MIDI control and he wanted a Digi for himself. Before going any further, I just have to point out that logo! I'm a big fan of logos, and that Pi Corp logo rocks. Seriously. Future-retro with a touch of Borg. I expect that symbol to appear on the side of Captain Picard's face when he's taken captive by the menacing aliens. The logo was designed by local Cleveland artist Phil D'Angelo - a friend of David Yost - around 1975. It's interesting to think that even with all of that earned media and a $200 price drop, the unit didn't seem to stick around in the market for too long. David Yost mentioned in an earlier email that they didn't sell too well. His exact words: "I think we sold two units". Now, I'm sure that's a bit of an exaggeration. At least I hope so because I would really like to score one at some point in the future. Otherwise, this guy might be my only hope (see photo - top right corner). Either way, this is a good lesson that even the best gear, with advertising and lots of earned media, can't always be successful in the marketplace. I'm not sure what else could have helped the Digi-Atom succeed. But I'm sure that if I did know, I would be enjoying myself on a beach somewhere right now spending my millions generated from telling others how to do it. Its already mid-January, and although I've only had two blog posts this year, I somehow feel its been ages since I posted an actual ad. 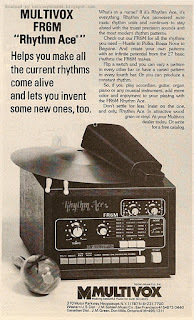 As far as I'm aware, this blog is still called 'retro synth ADS', so time to get back to the basics. And I think I'm starting with a gooder - ie: I'm already obsessing a bit. This looks to be the first and only follow-up advertisement to Talk Studio/Zypher's original Digi-Atom 4800 ad that appeared four months earlier in the April 1984 issue of Keyboard. There are a few notable differences between the two ads. The first, is that the second ad was shrunk down to a third of the size. I'm guessing at least partly due to ad budget, this size change would have a domino affect on other aspects of the ad. For example, because the ad was shrunk down to a 1/3-page, the company probably realized the photo was going to loose a lot of the resolution - so, why not save a bit more cash and use a black and white format. The only real loss is that 'pop' of the green button on the left side of the front panel. Smart thinking. That decrease in ad size would also have made the already small descriptive text that actually explains what the heck this machine does even smaller. So, the designer decided to make good use of the white space on the bottom left side of the original ad and increased the font size. Voila! Readable again! But for me, the biggest difference between the two ads has to do with the company names that are displayed. 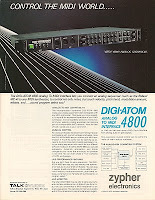 In that original ad, the two company names associated with the Digi-Atom 4800 are Talk Studios and zypher electronics. In contrast, both of those names are gone in this second ad, replaced with Pi Keyboards & Audio. I decided to Google "Pi Keyboards & Audio" to find out more information about this company and was genuinely surprised, and excited, by what I found. I found out a little bit about Pi and it's influence on the Cleveland electronic music scene through a Facebook page about the band "Ghosts in Daylight". Or, I should more correctly point out, it was a Google-cached page for the Face book page. Facebook kept telling me the actual page doesn't seem to exist any more. "While Cleveland is now recognized as home of the Rock & Roll Hall of Fame, the city actually fostered an active electronic music scene in the late 1980s. During this time, developing MIDI technology allowed for the connection and sequencing of electronic synthesizers and samplers. A small music shop, Pi Keyboards & Audio, served as a hub for many Cleveland-area musicians interested in this technology – it was also the place where Ghosts in Daylight purchased most of their equipment and made their early connections with the local music industry." Another Google result led me to Cleveland-area keyboardist Keith Chelm's web site. His bio page provides a brief note that he worked at Pi Keyboards & Audio in the mid-80s, along side none other than Trent Reznor of Nine Inch Nails. Now, that's a 'hub'! I contacted Keith Chelm to ask a bit more about the company and whether he knew any information about the Digi-Atom 4800. He didn't, but he did put me in touch with one of the owners of Pi (and apaprently drummer in Keith's weekend band!) - David Yost. Through a few email exchanges, I learned that David was one of the owners and CEO of Pi Corp, later changed to Pi Keyboards & Audio, from 1976 - 1990. The company wasn't just a sales and repair shop, but also enjoyed an international reputation for their technical work with Weather Report, Wendy Carlos, Billy Cobham, George Duke, Tangerine Dream, Uriah Heep Jean Luc Ponty, and Devo. That list isn't too shabby! He looks back on the early MIDI days as "busy, exciting, and rapidly changing". I asked him about the initial confusion of mixing analog and MIDI technologies in gear and he felt that most manufacturers made the switch with ease due to the foresight and prep work done by industry leaders, singling out Dave Smith of Sequential Circuits in particular. When I asked him about the Digi-Atom in particular, David replied that he thought it was a great piece of gear and was responsible for bringing the unit to the US as a distributor - the only time Pi got involved as a distributor for a foreign product. But, he explained that the lack of sales support from Japan and the language barrier worked against the success of the Digi-Atom. And, that after the few ads failed to generate business, Pi let the relationship with Talk Studios/Zypher dissolve. Of course, being a young Nine Inch Nails fan way back when, I just couldn't resist asking David about Trent Reznor's time at Pi. David explained that he hired Trent on the recommendation of one of the sales guys. Trent ended up moving from Pennsylvania to Cleveland for the job and worked at Pi for about two and half years. It was then that Bart Koster, owner of Right Track Studios, hired Trent... and, well, the rest is history. This info would make an excellent addition to Trent's Wikipedia page. It currently jumps from high school directly to his time at Right Track Studios. I have a lot more to say on the Digi-Atom in Part 2 of this blog post - coming on Thursday. Moog retail price list including Satellite, Sonic Six, Minimoog, Model 1130 Percussion Controller, Model 1150 Ribbon Controller, Model 1125 Sample & Hold, Satellite Carrying Case (Model "Satcase"), Minimoog Carrying Case (Model 1110), Model 1120 Foot Pedal Controller and Model 1121 Glide/Decay Foot Switch, from July 1974. 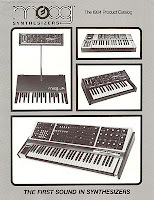 Update: Just updated the Moog and Korg interactive timelines with the latest advertisements. Great way to browse through the ads. 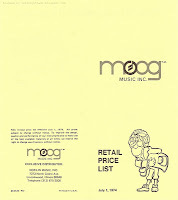 This is one of those Moog retail price list docs I wrote about in my first blog post of 2012 - the Moog 1984 product catalog. 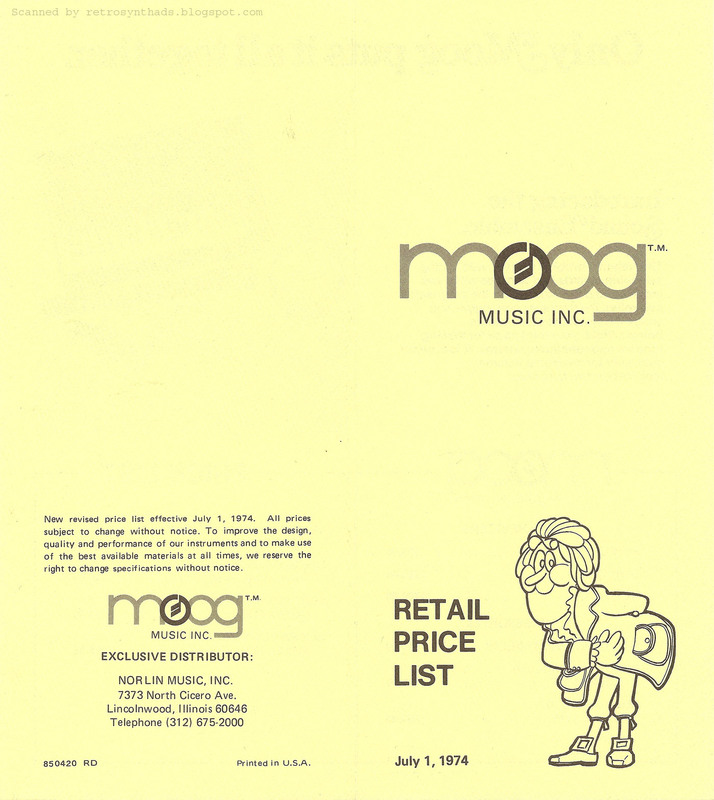 If you recall in that post, I explained that Moog historically had only a few main pricing documents for public consumption, including retail price lists and product catalogs. 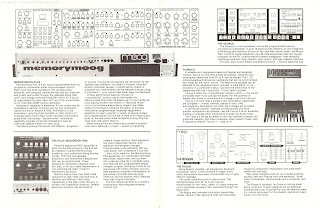 And that I was harping on the fact Moog had made the decision not to include actual prices in that 1984 product catalog. Its even more of a crime since as little as two years earlier they were including prices. But, a decade earlier, Moog was in fine form. And I say that both from a design perspective as well as a Moog historical document collector. First, we have a great little 8" x 9" brochure-style folding format printed on a nice thick paper stock. The light yellow colour of the paper is an interesting, and I'll admit readible, choice. The layout is fantastically simple with lots of space. All in all, a great doc that includes many of the features that make historical documents highly... er... historical. 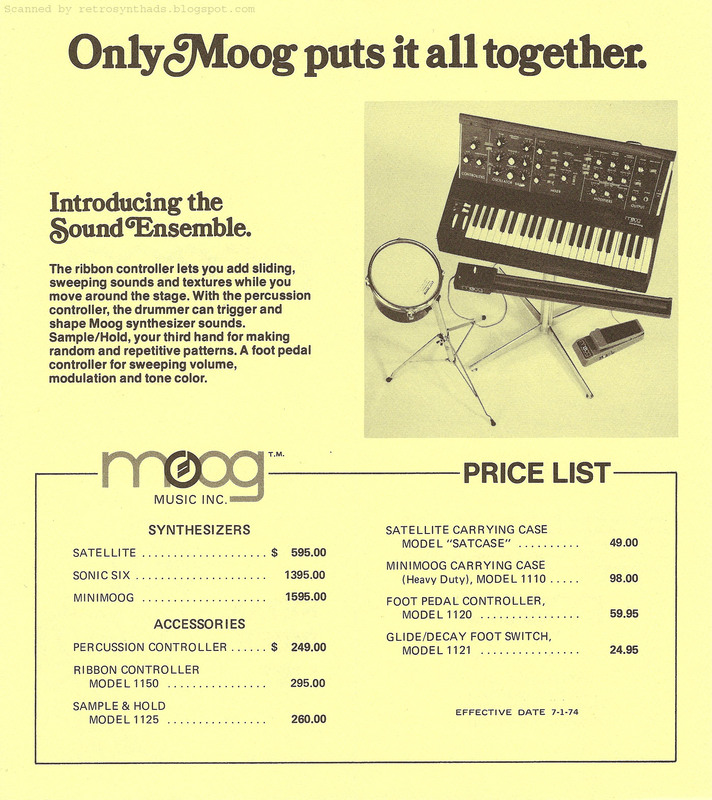 For one, readers of this price list always knew what company they were dealing with because that snazzy iconic Moog logo appears on all three pages - front, inside and back. But the best part is that at no point is the logo ever overbearing. It always fits the space provided perfectly. Also on the front cover is that gentlemanly composer dude that almost becomes as imprinted in my mind as the Moog logo itself. 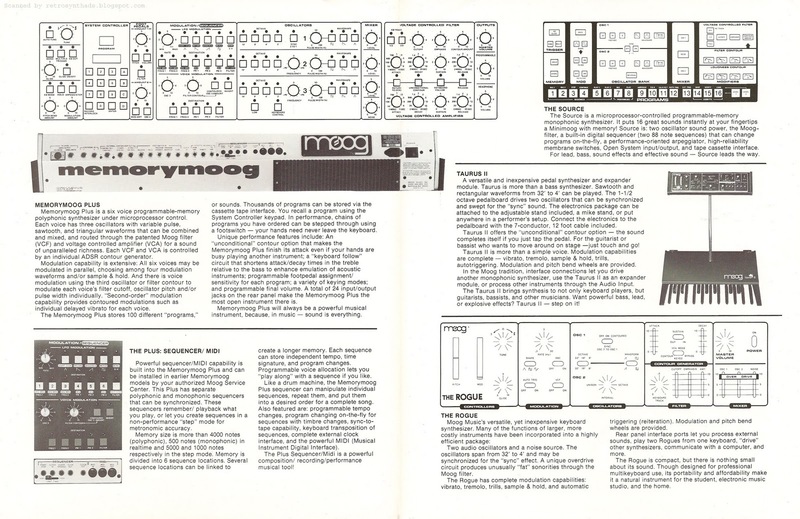 That little pre-clip-art guy made multiple appearances in a few pieces of Moog literature, including the hypnotic/epileptic-inducing 1972 Minimoog "The INstruments of the Pros..." brochure. Open the price list and you immediately discover Moog's big push of the day. Accessories! Or as Moog calls them - the Sound Ensemble - including the ribbon controller (model 1150), percussion controller (model 1130), sample/hold (model 1125) and foot pedal controller (model 1120). That little promo and picture takes up the whole top half of the brochure beneath the title "Only Moog puts it all together". And below that... magic! AKA retail prices. For not only the above accessories, but also for the glide/decay foot switch (model 1121). And heck, Moog wasn't just about the accessories. 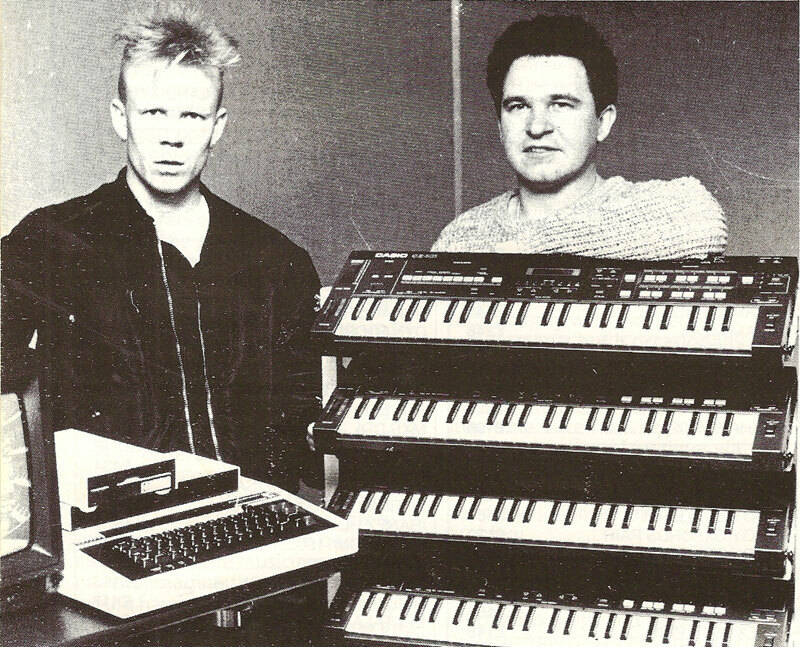 They were still building some fine synthesizers - the Satellite, Sonic Six and Minimoog. They give us historical price junkies 1974 retail prices for those too. And they print the date a second time in that price list box just for me! Nice touch. If you want to see other docs for these particular synths, I've posted and blogged the classic 1974 Sonic Six brochure and similarly-dated Satellite reference sheet. And my Minimoog label will give you a little helping of Mini-goodness in the form of that hypnotic brochure I linked to above, a reference sheet, and advertisements. Finally, Moog obviously reserved the back of the brochure for the lawyers. 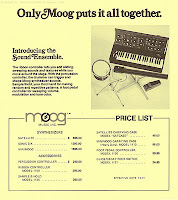 But, even with all that space available, Moog had the good sense to keep that fine-print rather fine. And if you historical buffs put on your reading glasses, what do you see in that fine-print? Another date! I've think I've died and gone to heaven. 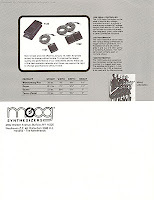 Moog 4-page product catalog from 1984. Wow. Its hard to believe this is year four of the blog. I seem to recall that I had three main goals when I started the whole thing back in 2009. All three goals seem to be on the right track. I've met a lot of new friends both through the blog and through online communities such as the forums on Vintage Synth Explorer. I've definitely become more adept at social media - although I still don't participate too much - just not in my nature. Will try a bit harder in 2012. And my word-count/hour has definitely increased. Not that it's saved me time since I seem to just write more in each blog post. Now, after a short holiday break (was it as good for you as it was for me? ), I'm ready to get back at it. I've got a new laptop with fresh installs of Sonar X1 Expanded, Reason 6, and ReNoise 2.7.2, a new hair-do, and a rejuvenated spirit after a great - and comfortably warm - Christmas break. And rather than continue on with the Korg Wavestation kick I've been on lately, I thought I would start the year off with this Moog catalog. Why? Well, for one - companies revving up for NAMM 2012 are starting their teaser campaigns, including Moog, who just announced their new Minitaur bass synth. Hello! Moog Music's online marketing campaign has created some serious buzz and I've beent racking its word-of-mouth mostly through the forums and, of course, MATRIXSYNTH, who has been updating his Minitaur post quite frequently. Okay, maybe not a clear comparison, but you get the idea. So, what the heck does all this have to do with this Moog catalog. Well, besides the great product name, great sound, and the great pre-NAMM online buzz Moog has generated, the thing I like most about the Minitaur is the price: $679.00! That's within almost everyone's price point. And, coincidentally, over the holidays while reorganizing my growing brochure and catalog collection, I became a little fixated on Moog's evolving prices. I've even put my Excel skills to good use and will hopefully have my own personal Moog historical price charting tool created in the near future. Retail price is the first thing I look for whenever I hear about a new product. And that is the first thing I look for on any vintage brochure, catalog or ad that I come across. It is a standard variable that is easily compared both between competing products and historically within a product's own lifetime. 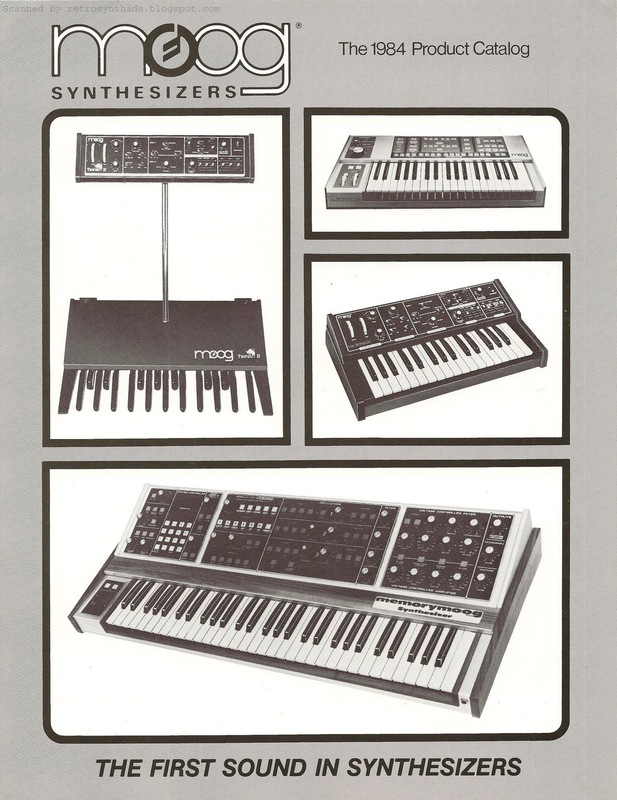 During the 1970s and 1980s, Moog had a few different documents that contained prices - full sized documents like this 1982 Product Catalog, and smaller retail price list brochures or pamphlets. And the obvious thing I like most about these docs is that they document the historical prices of each instrument. BUT this one is different. 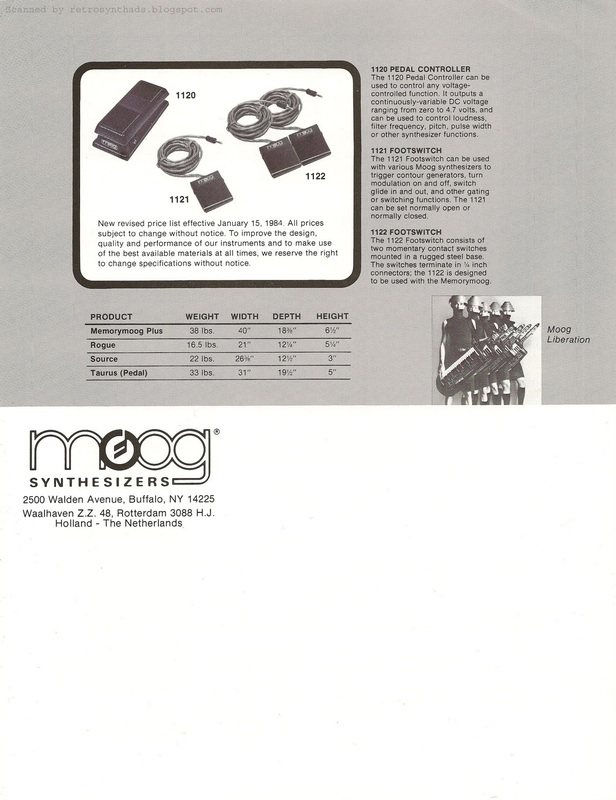 Moog made a conscious decision to not include prices in this 1984 catalog. But, there is a silver lining to this catalog. MIDI! The product write-up for the Memorymoog Plus contains a whole section on it's MIDI/sequencing abilities. Excellent! Now, I know we can't personally thank Bob Moog bringing MIDI to Moog instruments - he had been long gone from Moog by this time - but he did play a significant role in MIDI's development and acceptance. Back in a 2010 Prophet-600 blog post, I mentioned he had been writing about the development of MIDI in Keyboard Magazine as far back as October 1982. "There were also two nights for meetings with IMA, the International MIDI association. The attendees included Bob Moog, representatives and/or engineers from just bout every manufacturer involved with MIDI, yours truly, and various interested users. the results? We elected a committee to elect a committee to decide on what happens next. It seems somehow appropriate that 1984 should be the year that a standard interface is accepted and implemented by virtually the entire synthesizer industry, whether or not that standard can perform its functions as well as everyone would hope. However, if there was anything to be learned from the two nights of IMA discussions and three days of NAMM show, it was that while 1984 may be the year of the MIDI, there is enough dissent among manufacturers that 1985 might still be the end of it. Let's hope it doesn't happen." Wow. Not only is Bob singled-out, but this paragraph is also a great historical window into the early, rocky development of MIDI. It says so much about the industry at the time. Fantastic stuff. In any case, NAMM was, and still is a gathering place for industry to meet, discuss and introduce new products. Over the coming weeks, I can't wait to see what other products we might get a sneak-peak at!